This is a work in process. I saw this filed under “flannel board inspiration” pinterest, and I can’t get it out of my mind. So I made it even though I don’t have an activity to go with it yet. If my memory serves, Anne added it. 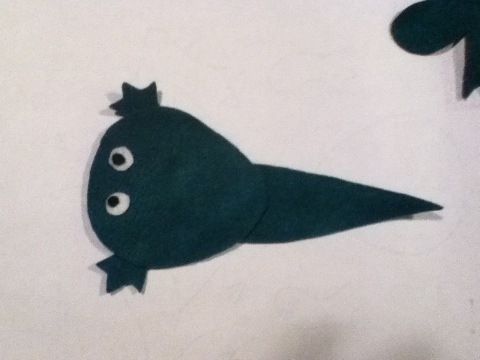 Any way, I had a feeling that if I made this flannelized tadpole-to-frog metamorphosis thingamajig, a usable storytime idea would follow. So, I’m looking at it, and still…nothing. But I am nothing if not persistent, so now I think that if I make a few more, maybe using a variety of weird colors (based the Amazonian frog research I am about to do) I’ll probably come up with something. Wish me luck! The #FFRU is hosted by Anne at so tomorrow. And if you have any frog-nificent suggestions for using this little dude, I’m all ears. Cheers! Categories: ALL, Early Literacy, Flannel Friday | Tags: frogs, metamorphosis | Permalink. now he has four feet. OK, as the pinner, I feel responsible so I put my thinking cap on and here are a few ideas of ways you could use this at storytime. Some of this might be better for older kids than you would get at your average preschool storytime. But preschoolers are pretty sharp too. That is why I never read about dinosaurs unless I am 100% sure how to pronounce their names. Pretend it is a flannel of this Life Cycle of a Frog book: http://www.enchantedlearning.com/subjects/amphibians/books/froglifecycle/. (Scroll down) I like this idea because I always think that incorporating nonfiction concepts into storytime is an underappreciated art form. 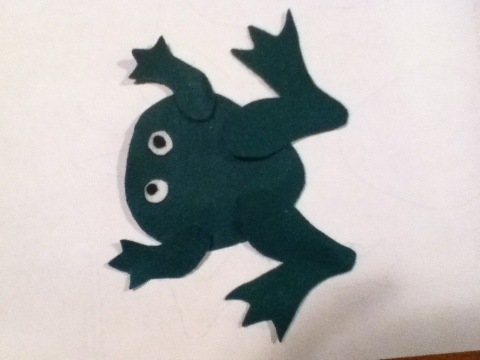 After that, you could have the kids practice with these sequencing cards: http://www.enchantedlearning.com/subjects/amphibians/sequencingfrog/. you’re very silly, but even more sweet. It’s funny I didn’t even realize I had no idea what to do with it until i was gluing the eyes on, and i was all wait a minute…I don’t know what to do you, Frog! I got a few idea-germs once i started making the purple, hot pink and teal frogs. I think I see myself writing a counting/color rhyme about the frog life cycle. BTW, I strongly encourage you, and anyone else to some time looking at pictures of amazonian frogs. If you do, try to keep a tally on how many times you say, “WHAT, that’s not a real frog, is it? !” I didn’t start counting until about 5 minutes in, and my total was 37. Anyway, there’s nothing I like better than a good group-think project (and it’s only after I typed that out that i realize that might make a “world nerdiest quotes” list). oh well, at least i found my calling, right. Oh and these are great resources. This will help me with my weird little poem. (And probably even my PiBoIdMo work for the day) woohoo! 2 birds, 1 stone!